Russell Westbrook kept attacking the paint, Carmelo Anthony took care of business from the outside and Steven Adams cleaned up the mess for everybody. In a 114-90 Thunder win over the Los Angeles Lakers on Wednesday night, a dominant rebounding effort helped fuel an efficient night on the offensive end for the group as a whole. It started early for the Thunder, who jumped out to an early 20-10 lead after Anthony found Paul George for a cutting dunk. It was happened before the score that defined this contest. There’s a LOT going on in this play...and it’s all good. Adams got fouled going for his own miss, and for good reason. The Lakers couldn’t contain him all night long on the glass. After George missed a three-pointer, rookie Terrance Ferguson flew in from the weakside and tipped a soaring rebound into the corner, where he dove over the first row and saved the ball back inbounds to Anthony. The defense rushed to converge on the prolific three-point shooter, and that’s what allowed George’s cutting layup. Ferguson’s chase down was one of 21 offensive rebounds for the Thunder on the night, leading to 26 second chance points as Head Coach Billy Donovan’s group out-rebounded the Lakers by 24. Adams was the unstoppable force down in the paint, racking up 7 of those offensive rebounds and drawing six fouls underneath the rim on his way to 21 points and 10 total rebounds, his 14th double-double of the season. “The effort and the persistence to keep going is what has made him dominant,” Donovan explained. Anthony was equally responsible for the Thunder’s hot start, knocking down his first two three-pointers in similar fashion. As the season has moved along, Anthony has gotten more comfortable following Westbrook in transition for catch-and-shoot three-pointers as the trail man. In the opening minutes of this one, however, it was George who attacked the paint and flipped two passes back out from the free throw line to the top of the key. Anthony caught set and fired, burying two of his four three-pointers as a part of a 27-point effort on 10-for-15 shooting that involved a mix of catch-and-shoots, driving attacks and post up jumpers. “He’s one of the best catch-and-shoots in this league. I’m very mindful of that. It was a conscious effort to find him,” George explained. “It’s definitely reads that you have to make, knowing where the ball is at. 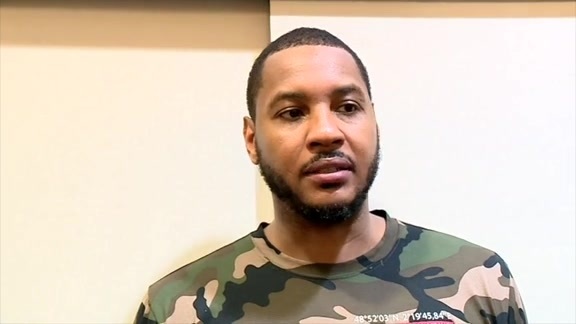 In the position that I’m in, trailing, you actually get an opportunity to see the whole court, see where the defense is set, see what they’re leading towards, see where the ball is at and just pick your spots from there,” Anthony described. It wasn’t completely smooth sailing for the Thunder in this one, however, as the Lakers hung around offensively in the first half and even led before Donovan’s club ended the half with a 9-0 burst to take a 60-54 lead at the break. To start the third quarter, the Thunder’s defense ratcheted up another level, and the Thunder again held its foe under 40 points over the final 24 minutes, making it three straight games accomplishing that feat. The defense was aided tonight by the return of Andre Roberson, who had missed eight consecutive games with patellar tendonitis in his left knee. Roberson actually got to work first on the offensive end, picking up four quick points on easy baskets at the rim off Westbrook passes. “It’s good to be back out there battling with my teammates,” Roberson grinned. "He was great tonight. His energy defensively, he did a lot of things that were very disruptive," Donovan reviewed. "I was more pleased than anything tonight (that) he was moving really, really well. After that, he settled into his disruptive defensive role, making deflections, thwarting drives and denying shots. 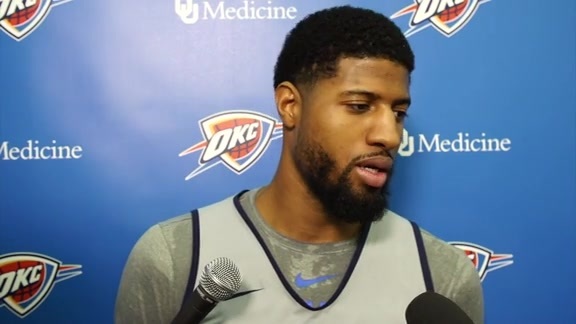 He played just 17 minutes in his return to action as the team brought him along slowly, but Roberson was effective as he picked up three steals and four rebounds to go with his four points and two assists. Needless to say, seeing the key cog in the Thunder’s defense back in the lineup was a welcome sight for the loyal fans in Chesapeake Energy Arena. “He’s a guy who changes the dynamic of our team defensively. We showed that tonight. He uplifts us as a team defensively,” Anthony said.